Receive email alerts of keyword rank change for individual keywords. A report like this including domain name, search engine and keyword with rank position change can be sent to your email address. 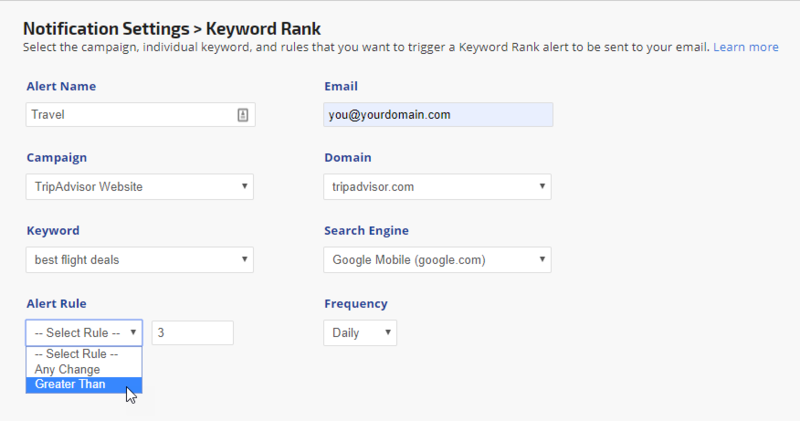 Open Tools > Email Notifications and scroll down to the Keyword Rank Alerts section. Click the Add Keyword Alert button. You can also click the Edit (pencil) icon to make changes to an existing alert, or click the trash can icon to delete an alert.